Growing up around extended family who were heavily involved in organic agriculture inspired Lars's interest in farming. 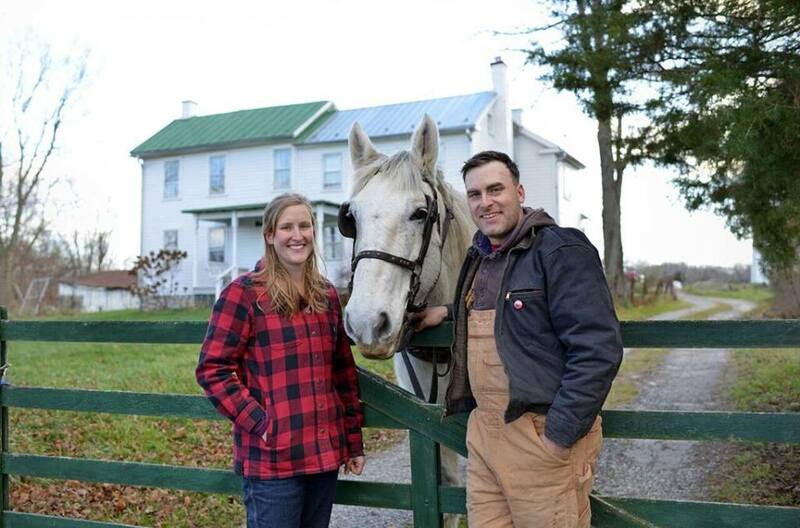 After completing an apprenticeship following responsible rotational grazing practices at nearby Smith Meadows Farm, he knew he wanted to farm as a career. Lars started Green Gate Farm with his parents in 2010. He now puts his ambition, energy, and enthusiasm to use managing the day-to-day livestock work and draft horse handling. Leslie grew up in rural Ohio and graduated from Otterbein College. Her interest in farming was sparked while studying abroad in New Zealand and seeing their progressive small farming movement. After graduating, she worked on small farms in Vancouver, Pennsylvania, and Virginia where she fell in love with having her hands in the dirt and learned the details of growing produce and running a farm. Now her knowledge is put to use at Green Gate Farm, where she manages the produce side of the operation. She loves being able to provide the best produce possible. At Green Gate Farm we're committed to being the best stewards of the land we can be. By combining traditional farming practices with contemporary organic methods, we're able to bring you high-quality food that's ethical, sustainable, and delicious. Our practices are firmly rooted in our core values and while farming the way we do isn't easy, we believe the results speak for themselves. We began using a draft horse at the end of the 2015 season as our primary source of power. Since then, we have increased production and therefore increased the number of horses necessary to work at Green Gate. There are a number of reasons why we decided to go this route. Firstly, we simply love horses and the relationships we build with them. Secondly, we are all about carbon footprint reduction. The horses can help to fertilize our fields, some of which fields are the very ones their hay comes from so they help to generate their own source of power. Another major reason for using draft animals is they have a reduced physical impact on the soil structure. They are much easier on soil than large equipment and as stated before can actually help add biomass to it. They can also be bred to produce more horses for future power. Our livestock are on a loose rotation in an effort to help build soil health. Our main livestock are pigs and chickens, but the horses graze our pastures as well, leaving manure that can help nourish the earth. The chickens will follow them and scratch through the horse droppings, helping to spread them more evenly and leaving nitrogen-rich fertilizer in their path as well. The pigs don't graze on our pastures as they root the soil too much and create hillocks and craters, but we do let them enjoy all of our tree breaks and wood lot areas, full of shade and fallen walnuts and mulberries. Life is pretty darn pleasant for animals at Green Gate Farm. Using cover crops is one of the many ways we take care of the soil so it takes care of us. After our fields are done for the season we sow a cover crop for the winter. This can be done with a number of crops but usually we do a rotation of rye and vetch, barley and peas, and/or buckwheat. These crops grow and are then mown and disced back into the soil to provide what's called 'green manure'. This method integrates the decaying plants back into the soil to add fertilizer, soil structure, and organic matter. It also helps suppress weeds, prevents soil erosion, and attracts beneficial insects. All of these benefits are done naturally instead of using synthetic fertilizers or sprays.